Prepare yourself for the unavoidable hangover the morning after dancing the night away with our very best hangover cure! Looking for the best gift for a hangover cure? 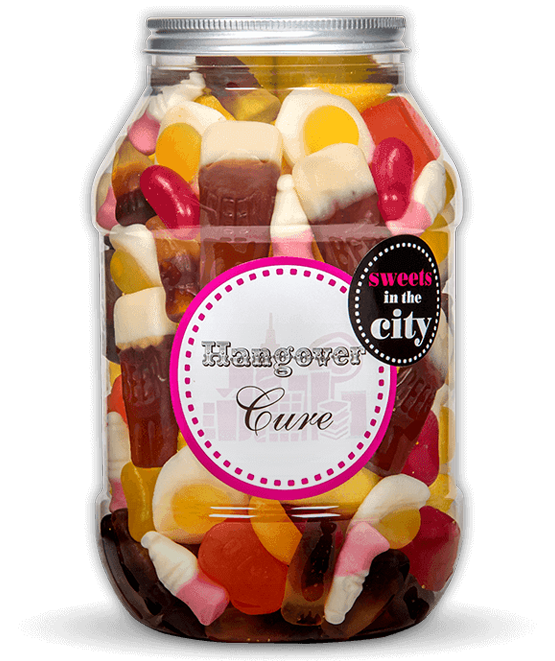 Well, these hangover sweets are perfect whether you're hosting an event, or simply as some hangover sweets for yourself, this jar will keep you in high spirits while you recover from last nights drinking! If you're looking for a unique hangover gift to give to your friend who seems to be feeling rough every other Sunday morning, look no further! 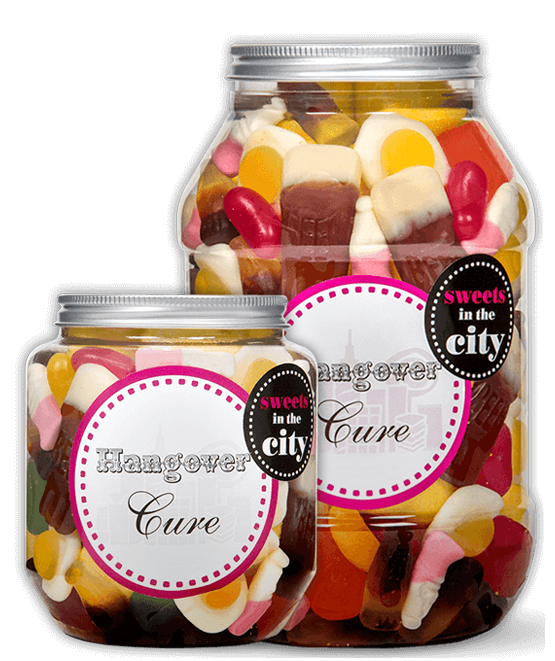 These hangover sweets make both an excellent hangover gift & cure - so your friend is sure to be thrilled! 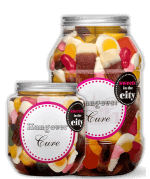 Our best hangover cure jar will aid your recovery with its hair of the dog sweet mix of Jelly Pint Pots, Wine Gums, Jelly Fried Eggs, Cola Bottoms, Strawberry Milkshake Bottles and Jelly Bean ‘recovery tablets’. 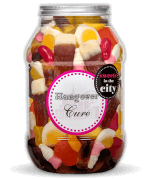 Ideal for a birthday, hen party or anniversary - these sweets are truly the best hangover cure a person could ask for! Product 1: Glucose syrup, sugar, gelatine, dextrose, acid, citric acid, caramelised sugar syrup, flavouring, glazing agent, beeswax, carnauba wax. Product 2: Glucose syrup, sugar, beef gelatine, humectant, sorbitols, modified potato starch, acid, lactic acid, flavourings, fruit and vegetable concentrates, radish, carrot, blackcurrant, vegetable oils (coconut, palm kernel) glazing agents, beeswax, carnauba wax, colour, E120. Product 3: Glucose syrup, sugar, modified maize starch, pork gelatine, acid, citric acid, colourings (E100, E120, E141, E153), vegetable concentrate, black carrot, flavourings, vegetable oil (coconut), glazing agent (carnauba wax). Product 4: sugar, glucose syrup, cornflour acid (citric acid), colours (anthocyanins, vegetable carbon, lutein, mixed carotenes), glazing agents (shellac, carnauba wax, beeswax), flavourings, vegetable oils (palm, coconut), stabiliser (gum arabic), plant extracts safflower, spirulina. Product 5: Glucose syrup, sugar, dextrose, gelatine, acid, citric acid, flavouring, fruit and plant concentrates, elderberry, lemon, mango, orange, passion fruit, safflower, glazing agents, beeswax, carnauba wax. Product 6: Glucose, fructose syrup, sugar, water, beef gelatine, humectant, sorbitol, flavourings, colour, E100. Product 7: Glucose syrup, sugar, water, pork gelatine, WHEAT, starch, acid E330, gelling agent, pectin, BARLEY malt extract, flavouring, colour, E171, vegetable oils (palm kernel, coconut) glazing agents beeswax, carnauba wax. 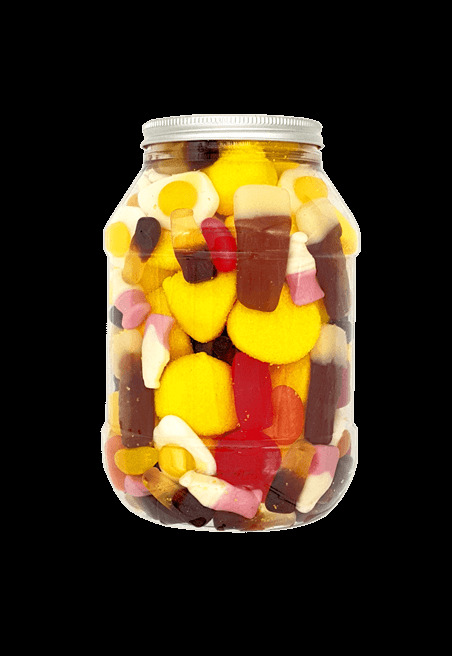 Hi, The delivery was great, however we were very disappointed with the content as the majority of the jar was made up of the big sugary banana flavoured pyramids (sorry don’t know the name). This was deceiving because from outside it looked like the jar had many pint pots, fried eggs, jelly beans and other sweets as well, but sadly this was not the case. I will not be purchasing again.